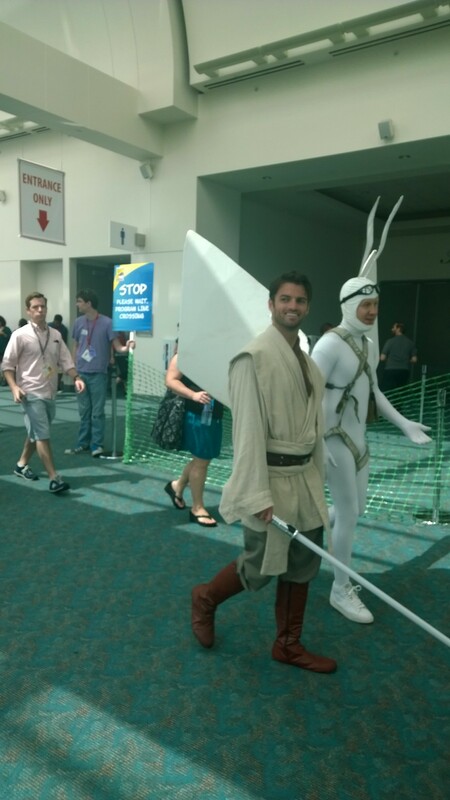 I went to Comic-Con this year. If you’re in publishing or another sort of media pro, you can apply for a free pro pass. I know! This year, my publisher submitted me to be considered for a panel, but I didn’t get one. They were nice and invited me to the Penguin party, but it was on Thursday! 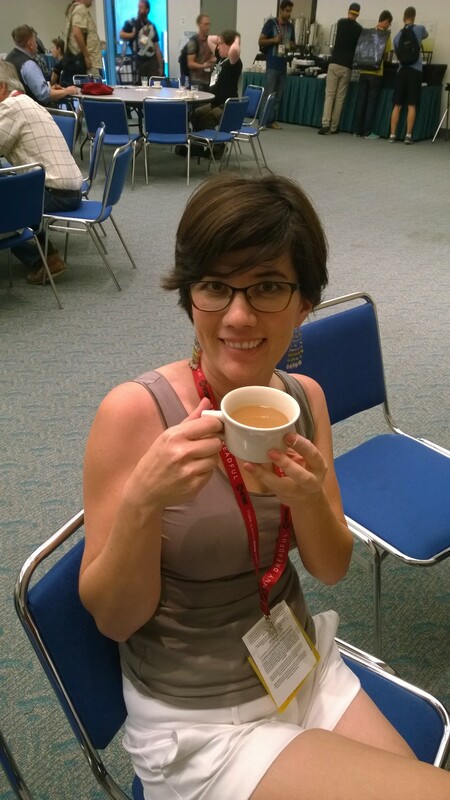 When I was still at BlogHer! The humanity! I know, embarrassment of riches, the likes of which I might not ever see again. This was my third time and my first time with Cadillac. Who is kind of a closet geek. That is, he lurves him some Star Wars, he is obsessed with Harry Potter, his favorite anime is Vampire Hunter D (he’s been a huge unwavering vampire supporter since before Anne Rice, even during the great Vampire Drought between Rice and Twilight). But from looking at him, could you really tell? Nope. It all adds to his complexity and mystery. Ha. The last two times were with the two older kids, which was a stress filled event for me. I am claustrophobic and don’t like crowds all that much and I’d rather just let somebody lead me around. The boy was ready to leave in 15 minutes while Eldest could have stayed all day. So, having Cadillac there was great. He pushes through crowds (people kind of bounce off him) and I just hold onto his back and jog behind. Also, he carried all our stuff. Also, he was amenable to whatever I wanted to do while suggesting things and looking at the map. And the air conditioning worked a hell of a lot better than it did two years ago. We went on Saturday morning, which at first wasn’t all that crowded because people were hungover from the night before and not coming in. My brother was also in town for Con, as he’s been going since the 90s, and he told us some tips. He told us to take the trolley (totally correct– driving down there is mayhem). And also: If you want to get autographs or buy things at special kiosks, like the Mattel kiosk, you have to go to a drawing at like 9 am. Then if you draw correctly, you can get in line. We didn’t much care about that, so we decided to walk around and see what we could see. First we saw this statue of Boba Fett (which my eldest just told me was the wrong color for Boba Fett, what do you think?) Cadillac’s fave Star Wars character! Here they are getting ready to go on a romantic picnic and walk along the beach. Then we saw a big old Hobbit display, where this Smaug slowly opened and closed his eyes. 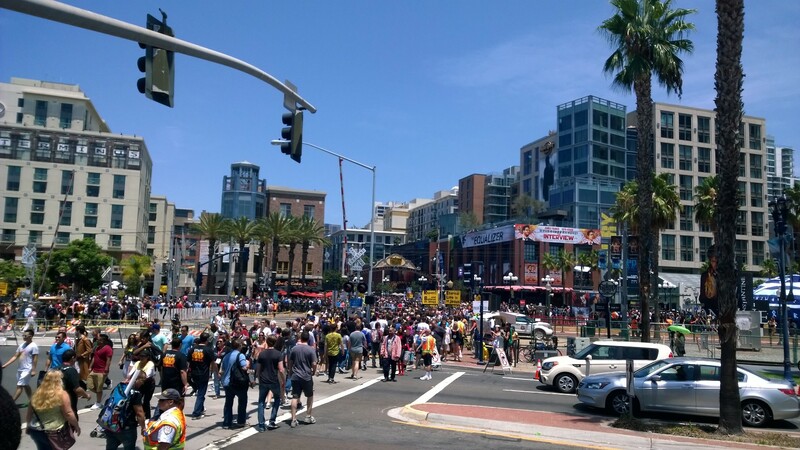 Basically Comic-Con is like walking through Universal Studios or the equivalent. They also had different experiences you could…experience. Like a lab thing from Bates Motel. Or The Walking Dead experience, which we didn’t wait in line for. Our kids gave us a list of souvenirs to find. This was a surprisingly hard task, especially for our son, who wanted a “pillow shaped like Bedsmith“, a character my brother assured us was super duper obscure. So we wandered up to the Pro Lounge. That’s right. While all you peons have to squat on the floor and get yelled at for leaning against walls, us Important Folk get to go into the Pro Lounge and have foot massages and brandy. Actually it was lemonade and coffee. Or tea. The coffee was really really good though. Then it was lunchtime, and we ventured out. Those crazy people with the REPENT signs were all there with bullhorns telling us we are all going to die. Um, duh? “Heretics!” I shouted at them. I’m sure they would have been aghast, had they not been so glassy-eyed. I used Yelp to find a sushi place. 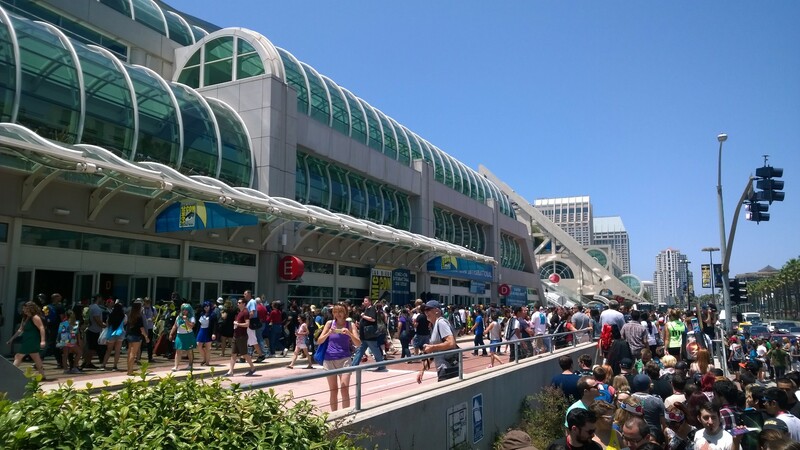 Which we found with a sign saying WELCOME COMIC-CON!And the hours (should be open). Then we found another sushi place (being in the mood) where they had a menu with like 4 rolls on it. None of which were my favorites. The lady said they were a pop-up just open for the Con. I did not like that. Then we went to a Mexican place, which had no air. I immediately stuck grossly to the seat so we left. Finally, we ended up at Seersucker, where we sat at the bar. They gave us the brunch menus though it was after 1. Before we were done eating, the bartender would tell the other patrons they were out of sandwiches. Out of sandwiches. Can you believe it? 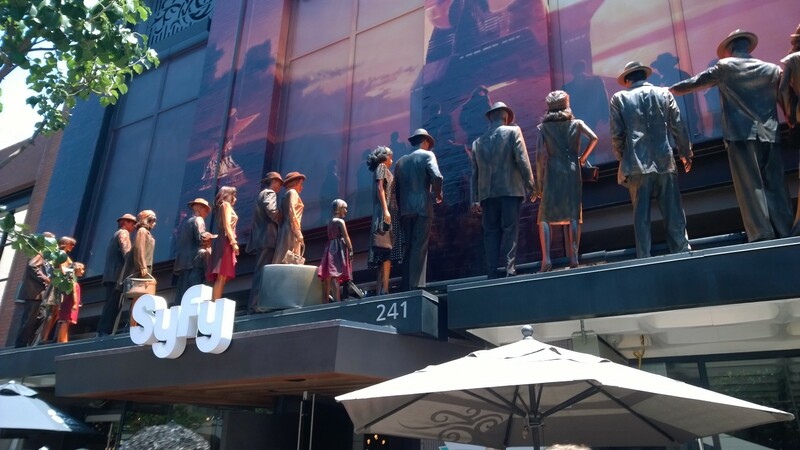 Lots of different shows/films decorated the buildings. Here’s one for the show Ascension. Then we headed to stand in line for the Grimm panel. It’s in Hall 20, which hosts various panels all day. They don’t clear the room so people get in early and sit. Sit. Sit. Waiting for Vampire Diaries. We were almost in and then we had to be stopped just before this hallway, across from the ballroom. Finally we got in and found the first available seats next to a family of wildebeests who were waiting for…you guessed it…Vampire Diaries. Which meant that they just freakin yakked it up. We were sitting quite far back, so we mostly watched the monitors. The program said they’d be showing a preview of the new season, but alas, they did not. Cadillac said the only actor he liked was the guy who plays Monroe and the rest were funny. Like not funny ha ha. “Having seen who they are in real life will greatly diminish my enjoyment of the show, ” he said. (Actually, he intoned. You know Cadillac. And yes, he talks like that). After that panel, we stayed for Vampire Diaries simply so we could talk through the whole thing and ruin it for those people. (not really. I thought about it and Cadillac said he was game, but I didn’t care that much). 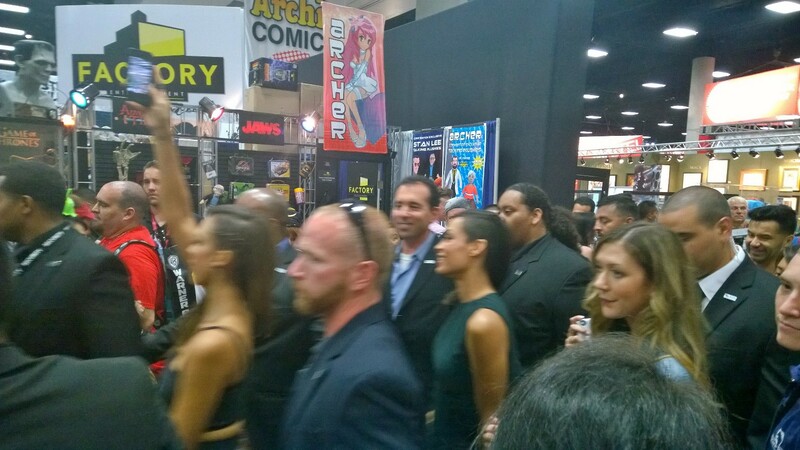 And Josh Brolin, Jessica Alba and Rosario Dawson (and Frank Miller, presumably, but who cares about him? He’s just a writer and director and artist. Totally boring!) came through for their Sin City panel. I whipped out my phone and managed to snag this somewhat blurry pic. Alba is holding up her phone taking a picture of the crowd. Dawson’s behind her. They were tiny, like actors tend to be. Small like pro ballerinas. Alba is very very pretty. I didn’t recognize Dawson until later. Brolin has a huge rectangular head that looks like somebody chiseled it out of a rock. Also a good feature for an actor. “Who are those people?” Cadillac asked. We are going to be such annoying old people, he and I. Then, up on a pedestal, we saw the girl from The Descendants and that hot guy whom Mary killed with her lethal lady-bits in Downton Abbey (seriously, every man she sleeps with dies. Her new suitors ought to be concerned). I actually looked up and just noticed Theo James and thought, “That’s that really hot guy from Downton Abbey! Who’s that girl?” because Woodley is a really great actress but looks like a regular girl. Which is refreshing, because all the actresses look the same these days. But she looked really tired. Who knows what they had her doing. I couldn’t get a pic because people (guards) were moving us along. Who else did we see? The cast of Constantine, outside. And possibly Harry Potter. And a cosplay convention goer lady who was pretty much nekkid except for some cyborg pasties over her breasts, and cyborg hands. 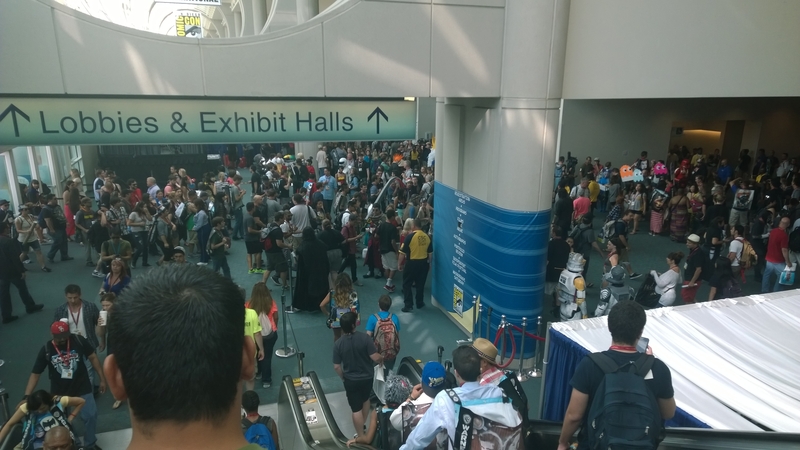 She had almost as big of a crowd as Divergent gawking around her.